I finished a Christmas gift today that is okay to share. It’s for my niece, Madie, and as far as I know, she doesn’t read my blog. 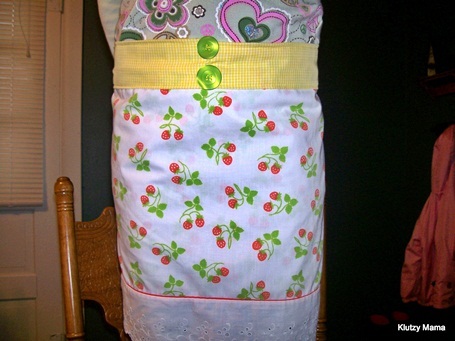 She loves to cook and I found this pattern for a pillowcase apron and thought it would be perfect for her. But before we get to the pictures, I have an ugly confession to make. I hate having to get ugly, but I cannot proceed in good conscience without first coming clean about this. THERE! I said it. I feel better. Remember how excited I was last year when I got my sewing machine? Well, I’ve tried to love sewing and I just…don’t. 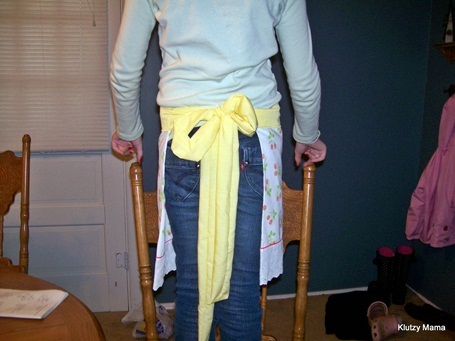 This pillowcase apron pattern is super DUPER easy. It would take a normal person probably 30 minutes to complete. Do you know how long it took me? Do you? 3 HOURS! I was not kind to myself during those 3 hours. I called myself lots of names and had out-loud arguments back and forth with myself for the entire duration. I felt completely drained and exhausted at the end. And then just when I finally finished the stinkin’ thing and I sat down to relax and take a deep breath and reflect on why I can’t seem to do the most basic of tasks, I realized that it was time to get supper ready. Oh it was a bad, bad day. I’m not exactly sure why I have a learning disability when it comes to sewing, but I just don’t get it. I want to get it. I really do. But I just don’t. I’m not getting rid of my sewing machine by any means. I’ll keep it around for any super simple projects that seem worthwhile. Or for when I get ambitious. Or for when I forget that I am stupid. Okay, now on to the photos, I say! I bought this strawberry print pillowcase at a garage sale over the summer for a quarter. I thought it was adorable and that I could surely find something to use it for at some point in the future. 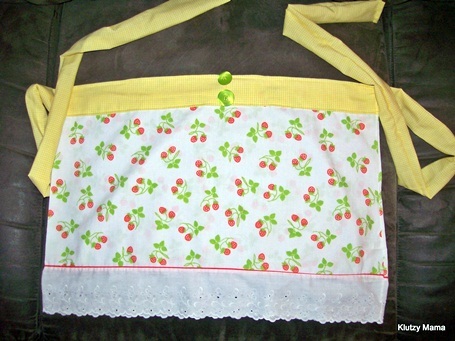 Then when I saw the pattern for the apron, I knew it was a perfect fit! Katie is modeling it for me. Madie is a good foot and a half taller than Katie, so it won’t be as long on her. The ribbon is a butter yellow gingham, but it seems to come across like stripes in the pics for some reason. I wanted to sew a cute pocket out of the gingham too, but after 3 failed attempts (do you understand my affliction now? 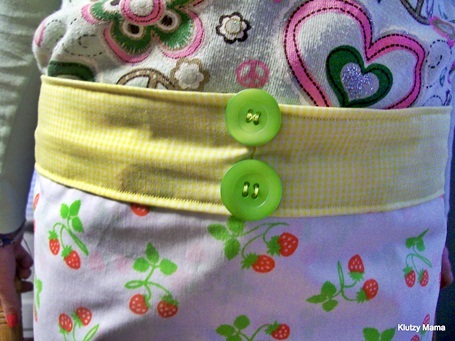 ), I was out of fabric and had to opt for 2 buttons on the top instead. I thought it turned out cute and I’m hopeful that Madie will like it too. Very cute!!! What a great idea! very cute, good job. Now you know why I hate sewing..reminds me of high school home economics when I had to make a skirt and it came out too tight. got a C- gave up sewing shortly after. I enjoy sewing when I am left alone to do it. Trying to sew and hearing honey why are you making those funny grunty noises and turning purple… not so much! Super Cute! I can sew a straight line without getting frustrated and angry with myself, but not much more than that! I feel your pain. Also, glad you enjoy my reading list…I have followed your recommendations as well. SHE WILL LOVE IT!!! You did a great job. It will mean so much to her that you made it. Poor lil thing, she got me…..the “if it dont come from a box, I aint making it” mother. She would learn a lot more from Aunt Mimi….I mean …..”Martha”. So if you ever need another helper in the kitchen just ask Madie! I think it’s adorable! You did a great job, too!! I like to sew small things. Not much on long tedious projects. I think it’s mostly because I don’t have a lot of time to spend on them. I do like to sew, when I have the time for it. I took on a denim quilt a few years ago that drove me nuts before I finally finished it. After a few washings it began to ravel out at the seams. Grrrrrr! Now it’s folded up in a closet somewhere waiting for me to repair it. Wonder if that’ll ever happen?